Testing in the FTTx environment just got easier with Yamasaki’s latest piece of PON Test Equipment, the TP40 FTTx PON Power Meter. 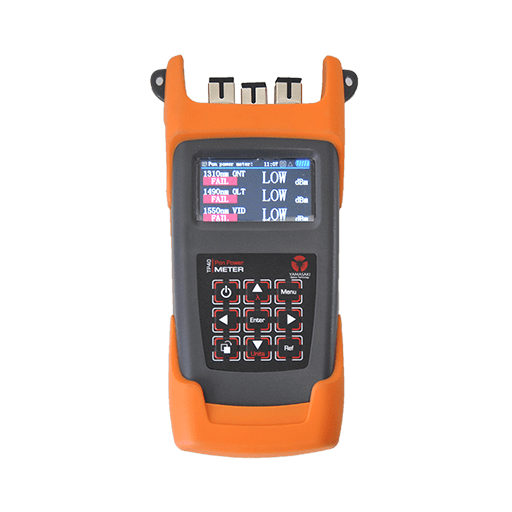 The TP40 includes FTTH PON testing, 6 Wavelength Optical Power Meter & Visible Fault Identifier all in one unit. The TP40 includes; FTTH PON testing, 6 Wavelength Optical Power Meter & Visible Fault Identifier all in one unit. Simultaneously measures 1310, 1490, 1550nm with 1310nmm wavelength upstream burst mode for communication with ONT. The TP40 FTTx PON Power Meter comes with a full 12 month warranty for add piece of mind. Using signal pass through for minimal disruption, the Yamasaki TP40 PON Fibre Optic Power Meter simultaneously measures 1310, 1490, 1550nm with 1310nmm wavelength upstream burst mode for communication with ONT. LED Pass/Fail/Warning indicators allow for instant assessment of power values. The USB port allow for downloading, saving printing of results, pass/fail threshold modification and self-calibration using the PC software and USB cable included. Six pre-set calibration wavelengths 850,100,1310,1490,1550 & 1625nm.